To quit smoking is difficult, regardless of whether you are a teen smoker or a lifetime smoker who smokes a pack a day. However, the process of quitting can be easy if you learn about the available options and prepare to quit. You can control your cravings, break off the addiction and join the masses of people who have managed to get rid of the habit completely if you have the correct game plan tailored specifically for your needs. You can help yourself quit smoking by being aware of things that set off your smoking habit, including specific activities, situations, people and feelings. Reason for Smoking: Is It to Relieve Overwhelming or Unpleasant Feelings? Managing feelings that are unpleasant such as depression, fear, stress, anxiety and loneliness are some of the common reasons for smoking in adults. Having a bad day can lead to cigarette smoking. Cigarettes may provide the comfort you need but you should remember that there are other healthier ways to keep those feelings of unpleasantness in check. They include meditating, practicing breathing exercises, exercising and engaging in sensory relaxation strategy. See your physician with regard to nicotine replacement therapy to deal with the cravings. There are nicotine inhalers and nasal sprays that can be prescribed and medication as well such as varenicline (Chantix) and bupropion (Zyban). There are other therapies available such as gum, lozenges and patches available over-the-counter. After years of research, it is only recently that the FDA (Food and Drug Administration) announced that there are not major safety concerns when using several nicotine replacement and over-the-counter therapies at once. So while trying to quit and you’re on lozenges, gum or nicotine replacement patches and you slip up and smoke, you can still continue using the therapies as opposed to giving them up. Try and avoid the situations that made you smoke or chew tobacco such as bars, parties or even while watching TV. Identify these situations and come up with a plan to either get rid of them completely or go through them and not succumb to using tobacco. In short, avoid anything that would make you relapse. For instance, if you smoked while talking on the phone, occupy yourself with an activity like doodling on a piece of paper. If you get a craving, convince yourself to wait for 10 minutes first; then distract yourself during that time with something else. This trick is enough to keep your thoughts off tobacco and you should repeat it again and again. Keeping you mouth busy can also help when you try to know how to quit smoking. Fight the tobacco craving by chewing on hard candy, sugarless gum or munching on nuts, raw carrots and celery or anything that is crunchy and satisfying. 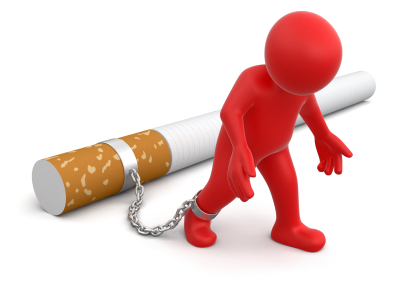 Don’t give in to the temptation of smoking just one cigarette to quench the tobacco thirst. One is too much and 100 may not be enough because one cigarette will turn into two, then three and so on. This may lead you back into addiction. Engaging in a physical activity is a good distraction from the tobacco craving. Half an hour of controlled physical activity can get your mind off tobacco, so jog or go for a walk outside. In case you’re stuck in the office or in the house, try doing pushups, squats, walking or running up and down the stairs. In instances where physical activity is not your interest, then you can try journaling, needlework, prayer or woodwork or engage in chores such as paperwork filing or vacuuming. It could be that in the past you were used to dealing with stress by smoking. Resisting this craving can be stressful. Take some of the stress off by engaging in relaxation techniques such as yoga, hypnosis, deep-breathing exercises, massage and visualization. How to quit smoking? It is important to have a support system for moral support. Have someone who you can reach out to when you’re craving for tobacco. You can have a chat, take a walk or share a laugh or two or get together to encourage each other. You can go online and join a program to stop smoking, get to know how others managed to kick the habit or how others are dealing with their cravings for tobacco. You can either write down or say loudly why you want to resist the cravings and quit smoking. This will leave you feeling better, you’ll get healthier and most importantly you’ll save the people you love from secondhand smoke. If you happen to be a closet smoker, you’ll end up saving a lot of time because you don’t have to hide the habit anymore. When you decide to quit, the first days or week is the most difficult time. This is because the nicotine is starting to be expelled from your body and you’ll be more irritable and feelings of depression and tiredness are very common. Once you are past this stage, feelings of normalcy will return, but the tobacco cravings will still be there. Surround yourself and spend time with people who don’t smoke. This will help you quit smoking because you’ll get to see that you have become a different person. In the process of quitting, you’ll miss smoking and even become sad about it, which is normal. But be careful because such feelings can make you feel like smoking.